So fast and easy to make! 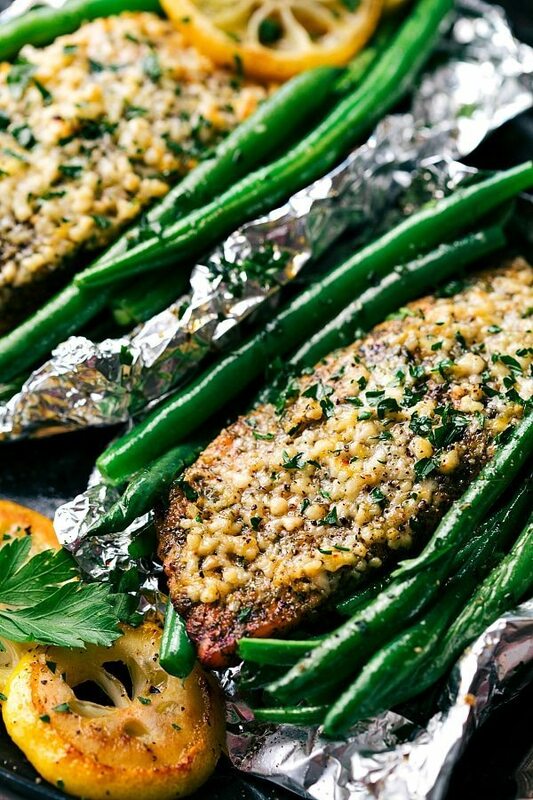 Lemon garlic parmesan salmon and green beans in foil packets cooked over the grill or in the oven. The entire homepage of my website looks like tin foil dinners, so I thought I’d add to the look and share just one more tin foil dinner… ? So I now present: garlic parmesan lemon salmon! 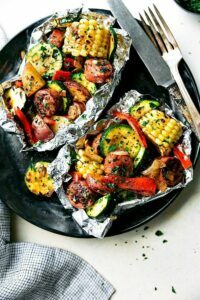 Made in a tin foil with no more than 10 minutes prep time. ?? On a kind of related side-note I made the mistake of telling my toddler we were eating fish for dinner after making this dish. He’s developed a recent obsession with fish ever since his grandma took him to see “Finding Dory” in the movie theaters. After seeing that we also bought him a goldfish which he named “Green” (??? perhaps because his name is Grey?) and absolutely adores. And yes, the goldfish is 100% orange. There is not a spot of green coloring on him. He asks to feed the fish about 839293 times a day, tries to “pet” him, and sings to him. All I have to say is thank goodness the fish is still alive for his sake. When I did tell him we were eating fish he got super stressed out and checked to make sure I hadn’t cooked up his beloved Green. He was relieved when I hadn’t. He also wouldn’t eat dinner because, well, how could I do such a horrible thing as cook up one of his best friends? Soooo…. with an intro like that, I’m probably not very convincing in the fact that you NEED to make this dish. So let me fix that really quick. You NEED to make this dish! 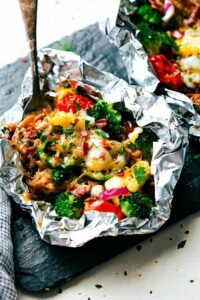 This tin foil salmon dinner is ridiculously easy and quick to make and super flavorful. It’s perfect for the summer time and especially great because: no clean up! 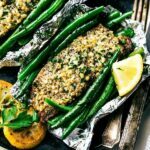 I’ve included directions for how to bake this tin foil salmon, but we’ve also tried it (and love it) on the grill. To grill these packets: preheat the grill to medium-low heat and place the packets on medium-low heat. Cover the grill and cook for 13-16 minutes (or until the salmon is cooked through) making sure to rotate the packets 1/2 turn at about 7 minutes into the cooking time. Tear 4 pieces of heavy duty foil about 14-15 inches long. Lightly spritz each piece of foil with nonstick spray. 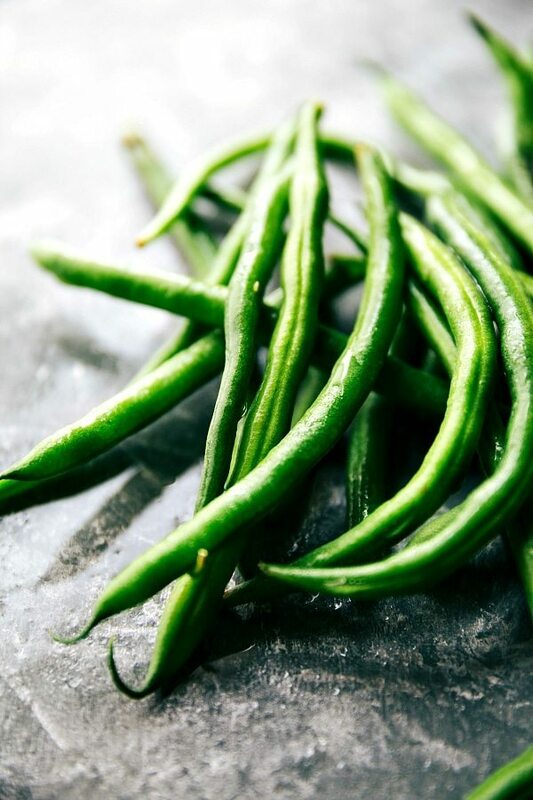 Place the green beans evenly in the center of each piece of foil. Drizzle each set of green peans with 1 teaspoon of oil and sprinkle with salt and lemon pepper seasoning. Divide 1 teaspoon minced garlic evenly among the beans. 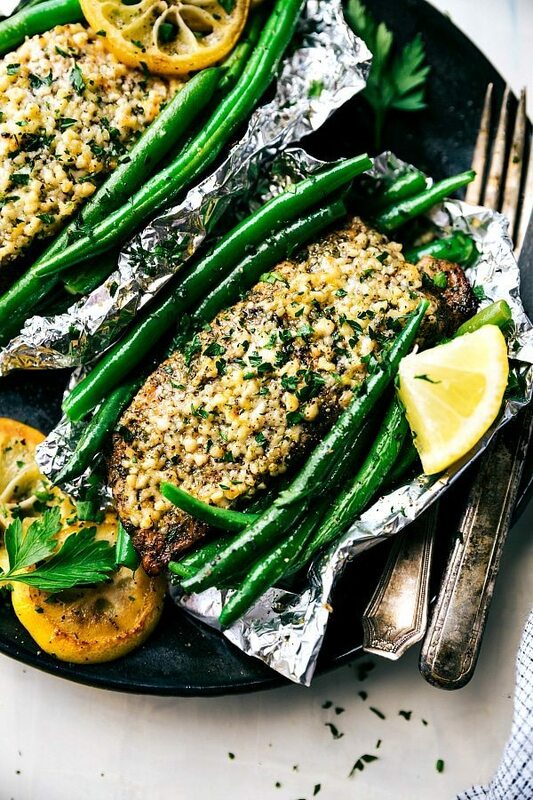 Lightly salt and pepper (with lemon pepper seasoning) each salmon filet and then place each filet in the center of each piece of foil on top of the beans. In a bowl, stir together the butter (do NOT melt), Parmesan cheese, about 2 and 1/2 tablespoons freshly lemon juice, 1 teaspoon lemon zest, and remaining 1 teaspoon garlic. This should be a thick paste and not at all watery. Divide the paste evenly on top of each filet and rub evenly across the top. Seal the foil packet by bringing the right and left sides together and then folding down and sealing and then folding up each end to seal. Make sure the seal is 100% complete. Make sure you allow space in the packet for the heat to circulate and for expansion. Bake for about 22-27 minutes or until the salmon is cooked through. Remove from the oven and (optional) turn on the broiler to 550 degrees F.
Open the salmon packets so the top of the salmon is exposed and place under the broiler for 30 seconds to 3 minutes (watch closely) or until the parmesan crust is slightly crispy. Remove and enjoy immediately with fresh chopped parsley and a squeeze of lemon if desired. Add some additional lemon pepper seasoning as desired. Chelsea , I love this website. Your recipes are not only delicious but so simple to make. I love it. Thank you. Okay you weren’t joking about the tin foil dinners! They’re super easy to make with practically no clean up! I made your sausage and veggie one a couple of weeks ago and it blew everyone’s mind! I will be making this one soon. Thanks for sharing! 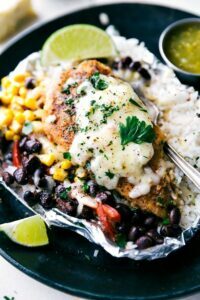 BakedSalmon ##SalmonInFoil #Healthy #Easy”, “By cooking this Lemon Garlic Butter Baked Salmon in Foil, salmon is tender and flakey when you remove it from the oven. I have an odd question. I bought fresh salmon but put it in the freezer when I went on vacation last week. Can I still use it for this recipe after I thaw? Sure! 🙂 Make sure you dry the salmon before adding the toppings! Can I make this recipe ahead of time and store the packets in the fridge? I wouldn’t recommend it; I think it would end up a bit soggy. Sounds like a great recipe! I have one question: it says 4 teaspoons olive oil but only calls one teaspoon used over the green beans. What about the other 3 teaspoons? Ah-maze-zing! First time I’ve ever successfully made salmon, and house doesn’t smell like fish because it’s cooked in a packet. Thank you! So happy to hear that! Thanks for the comment! Amazing Recipe! I really impressed. It is looking so yummy. Hi! Suddenly discovered foil packets for meal prep for work. Will be making this next week, sounds delicious. Quick question though. Is there a reason why the recipe calls for skinless salmon? you deserve 5 stars for this. Ohh Fish! Looks alot yummy. Maybe I am gonna try this next weekend. this is an amazing recipe it seems delicious I can’t wait to share it with my family thanks for sharing with us! this is amazing share.. Nice work by you.. Tasty treat you have shared. Keep it up ?